I recently spent around 12(!) hours in Amsterdam, and what an amazing city it is! 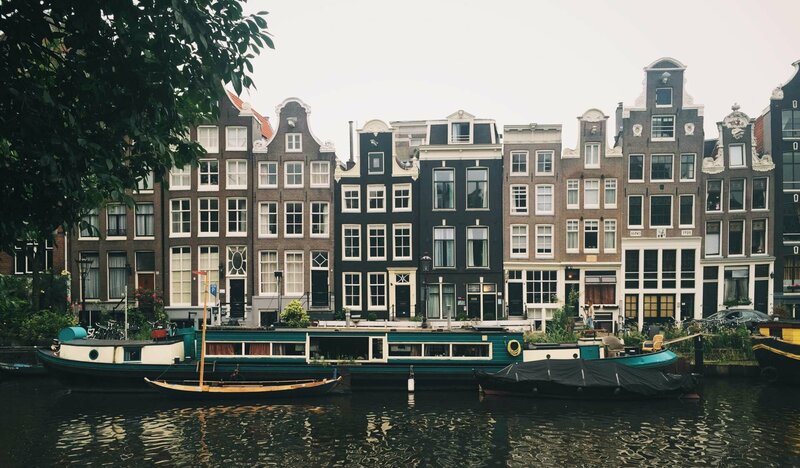 The canals, the crooked, narrow apartment buildings (Amsterdam is sinking y’all!) and the uber cool bicycle scene is just some of the stunning scenery this capital has to offer. This is by all means not an ultimate travel guide since we only spent half a day here, but I wanted to share the areas and places I went to since our stay was very successful. Eat: A delicious, healthy breakfast at Greenwoods, right by the canals in Singel street. This place whipped up one of the best chicken and avocado sandwiches I’ve ever tried. Stay: At the W – the hotel is steps from its vibrant nightlife and shopping scene. Enjoy the rooftop cocktail bar that even offers an outdoor pool. Shop: In the Negen Straatjes area. This shopping area is located in the canal district and is full of narrow streets. These nine streets connects the main canals between Leidsestraat and the Jordaan district. You will find art galleries, cafés, restaurants, small boutiques and a lot of great vintage stores. Walk: All over the city, or rent a bicycle. Party: At Chicago Social Club – this night went straight to my list of my best nights out ever. The theme of the night was 90s R’n’B which was a pleasant nostalgic trip down memory lane. Excuse me …! (to ask for something) – Mag ik even wat vragen?